What's Easter without a bunny? 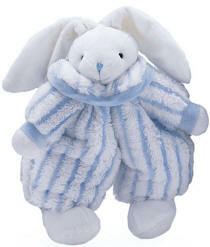 Choose from cuddly plush white bunnies with pink or blue ears, pink or blue striped bunnies, or any of our other selections. Most can be personalized with a child's name to create a wonderful Easter gift and addition to their Easter basket. 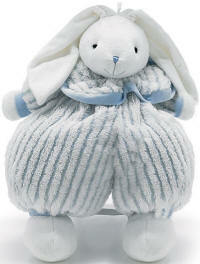 Perfect for a first Easter keepsake too. Perfect for an Easter basket stuffer or just for cuddling. We monogram a name in any color of your choosing. Usually ships within 1-2 business days. Floppy the bunny will steal your heart! His long velour ears frame his cute face with embroidered accents. Floppy is so loosely stuffed he�s very cuddly and soft. His fur outfit is white with light blue stripes, and he has a wide neck collar. Floppy is about 13 in. high. A hanging ribbon is attached to his head. Recommended for three years and up. Polyester fiber and pvc pellet filled. Floppy the bunny will steal your heart! His long velour ears frame his cute face with embroidered accents. Floppy is so loosely stuffed he�s very cuddly and soft. His fur outfit is white with light blue stripes, and he has a wide neck collar. Floppy is about 20 in. high. A hanging ribbon is attached to his head. Recommended for three years and up. Polyester fiber and pvc pellet filled. Meet Dee! She's our cutest little bunny from Bearington. Her lavender dress has an embroidered bodice and is trimmed in moss green. Matching green bows are in her hair. 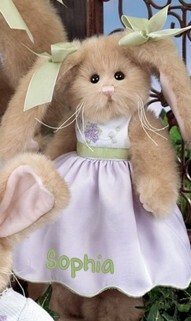 Dee is the perfect gift for a little girl for Easter, or for your flower girl at your wedding. Her dress Velcros at the back and is easily removable for dress-up play. She is about 10 inches high. We personalize on her dress with an embroidered name and date. Not for children under 3 years of age.